A: The Harvard Varsity Club (HVC) is a group of undergraduate student-athletes, alumni, parents, and friends who have operated under the mission of preserving the traditions, fostering the ideals, and advancing the interests of Harvard Athletics since 1886. With more than 30,000 members around the globe, we are Harvard’s largest affinity group. Preserving Traditions: The HVC has been preserving the traditions of Harvard Athletics since 1886. The most prominent examples are the Susan and Cory ’90 Thabit Varsity Lettersweater Program, Senior Letterwinners’ Dinner, HVC Hall of Fame, and the H Book series chronicling the history of Harvard Athletics. Friends Group Support: The HVC provides fundraising, stewardship, volunteer, and event management support to Harvard’s 24 Friends and Special Interest Groups. In a typical year this means that we will assist in hosting more than 80 Friends events, managing roughly 200 volunteers, and sending thousands of emails -- all while helping the Friends Groups meet their annual fundraising goals. A: The HVC assists all Friends Groups, but we are not your Friends Group. The HVC provides specific services to Friends Groups (annual reports, banquet and event planning, Board support, etc. ), but is its own separate 501(c)(3) organization with its own checking/savings accounts, endowment, payroll, HR, etc. Annual dues and donations to the HVC support the behind-the-scenes activities that benefit 1,200 student-athletes across all 42 of Harvard’s varsity programs…as opposed to a gift to a Friends Group which helps fund budgetary needs for 1-2 teams. Lettersweaters, Career Services, the Welcome Back BBQ, and the Senior Letterwinnners’ Dinner are some of the educational and social enhancements for all student-athletes. All-Sport Reunions, Golf Tournaments, and the Hall of Fame Dinner are a few activities that help build and strengthen the overall Harvard Athletics community. HVC members also receive discounts on HVC events and merchandise -- including new Lettersweaters and DHAs to replace those well-worn items in your drawer -- a subscription to our e-newsletter, News & Views, and access to our member database. You can submit your annual dues online here, send a check made out to the Harvard Varsity Club to 65 North Harvard Street, Murr Center, Boston, MA 02163, or you can call our office at 617.495.3535 Monday through Friday between 9AM and 5PM EDT. Q: Paying dues every year is a hassle. What can I do? A: Become a Lifetime Member. HVC Lifetime Memberships provide permanent funding for the HVC through an endowment which lessens our dependence on annual dues and donations. 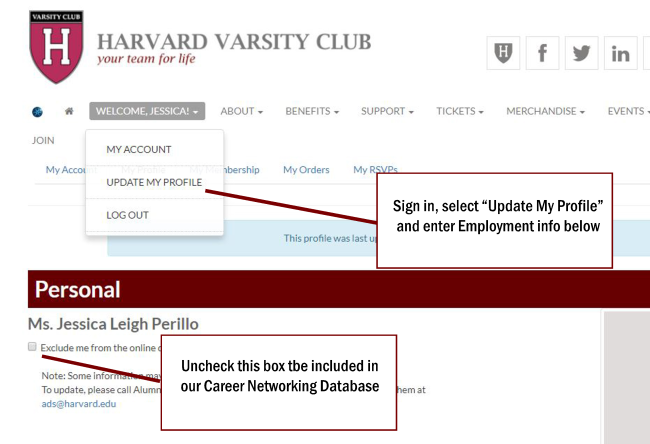 As a Lifetime Member you will gain priority access to HVC events and high-demand Harvard Athletics events, and will be recognized on the next Lifetime Member plaque -- there’s no easier way to get your name on a building at Harvard! We now have more than 400 Lifetime Members. View their names here and see which of your classmates have etched their name in history.